MANILA, Philippines – June Mar Fajardo won his 5th Best Player of the Conference Award. Likewise, his team won Game number 4 after beating Ginebra, 94-85, and took a 3-1 series advantage on March 3 at the Smart Araneta Coliseum. To summarize the 1st period, it was all San Miguel Beermen from the opening tip up to the closing buzzer. Arwind Santos initiated the three point festival followed by Chris Ross, Alex Cabagnot and Marcio Lassiter. 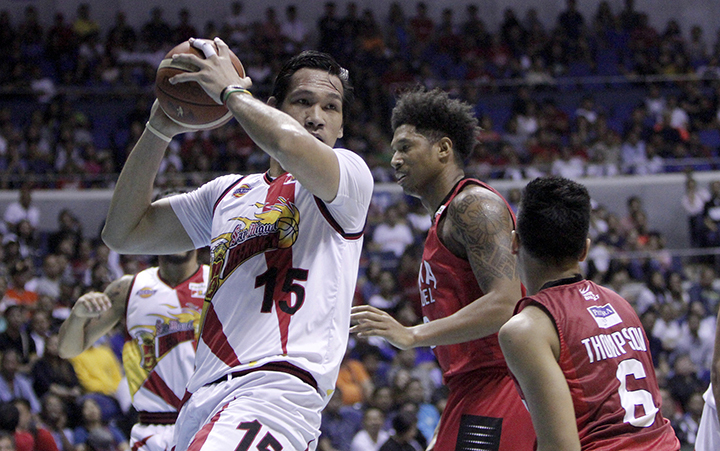 It was only June Mar Fajardo among the starting five who didn’t shoot from the rainbow territory. But, prior to the jump ball, “The Kraken” received his 5th Best Player of the Conference award matching his mentor and another “San Miguel Grande” Danny Ildefonso. Ginebra on the other hand, struggled to find their rhythm until Joe Devance placed them on the scoreboard after four long minutes. Devance was accompanied by Sol Mercado and LA Tenorio as they closed the first and behind by 12, 30-18. 2nd quarter was no different from the previous one, even though SMB starters were on the bench, the super subs continued to rain threes led by big men Yancy De Ocampo and Gabby Espinas together with ex-Ginebra and legit gunner Ronald Tubid. With 6 more minutes remaining in the half, the Beermen had already established a 20-point humongous lead, 44-24. San Miguel added 4 more points to force Coach Tim Cone to re-group his Ginebra crew. Chris Ellis who’s been playing quality basketball in this series, stepped-up after the time-out to trim the margin. The high-flying Ellis dropped 6 quick significant points that left San Miguel Coach Leo Austria to call a ceasefire of his own. It was a good time out for the Beermen. The starters went back in and increased their lead to 21, 54-33 before heading to the dugout. With the desire to replicate their dominance in the first half, San Miguel landed more baskets at the start of the third. SMB posted a 5-0 run in less than a minute. Again, disappointed Tim Cone called a break to strategize and formulate a counter tactic against the surging Beermen. Ginebra managed to cut the lead after the time out courtesy of Japeth Aguilar and Joe Devance. Steadily, they were closing the gap to prevent a 3-1 series lead in favor of San Miguel. Defensively, the Gin Kings did a great job in limiting June Mar Fajardo outside his comfort zone. Aguilar for an instance pushed Fajardo away and allowed him to take the shot from the baseline and blocked his jumper. With under a minute remaining in the penultimate quarter, Ginebra blitzed an 8-0 run and found themselves downed by just a dozen from as high as 26. Joe Devance was the man of the quarter despite of playing with a foot injury. The Barangay ended the third in high spirits and hoped that San Miguel will also blow a 26-point lead just like what happened to them in game number 2 in Lucena City. Still, San Miguel was up 76-63. Obviously, the San Miguel Beermen didn’t want to waste their efforts in building a comfortable lead, so Chris Ross and Ronald Tubid made a way to even solidify their margin. However, Kevin Ferrer crashed SMB’s scoring party by draining a back-to-back three pointers and altered SMB’s advantage to just 10, 82-72. The game intensified and fans were literally on their feet as the midway of the last quarter approached. Bodies flew left and right, everyone dove and scrambled for the loose balls. Ginebra kept fighting and scoring but San Miguel did the same to maintain a 10-point lead. At the 2-minute warning, LA Tenorio broke the SMB’s long-standing-double-digit lead from the outside, 83-92. Japeth Aguilar on the other side of the court, denied June Mar Fajardo again for the 5th time in this game alone. From the highest of 26, San Miguel then realized that it was all gone. 7 points was all they had under a minute remaining in the ball game. Nevertheless, the Beermen melted the clock and sealed the game in a nail-biting fashion. San Miguel is now a win away in retaining their All Filipino Cup title. Chris Ross for the second time won the Best Player of the Game with 17 points and 9 assists. Game number 5 will be on Sunday at 6:30 p.m. at the Smart Araneta Coliseum where San Miguel can close the series. TV5 will air the game live while live streaming will be available on thesummitexpress.com.